Fiction – Kindle edition; Wildfire; 368 pages; 2018. 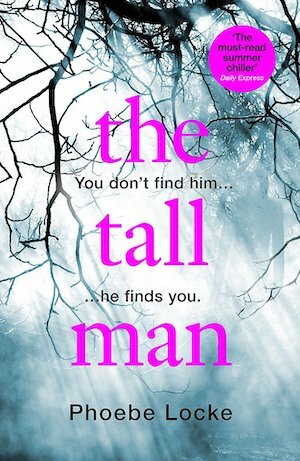 Phoebe Locke’s The Tall Man uses this incident, albeit translated to the UK, as the basis of her creepy, psychological suspense novel. Divided into three separate storylines set in three different time periods (1990, 2000 and 2018), it largely follows the exploits of 18-year-old Amber Tanner, who is the subject of a documentary film project. Self-obsessed and self-aware, she’s very much a closed shop and the documentary makers are having a hard time getting her to open up about the murder she committed a year or so ago. This storyline is intertwined with two earlier ones. The first focuses on Amber’s upbringing in rural England, abandoned as a young baby and raised by her father single-handedly to become a too-good-to-be-true devoted daughter, while the second charts how her mother, Sadie, having devoted herself to a sinister figure known as “the tall man” in her childhood, spends her adult life frightened of him because of his deep desire to steal daughters and, in particular, hers. Eventually, each of these three storylines coalesces into a powerful, if somewhat disappointing, ending, but this isn’t your average psychological thriller. Locke weaves in elements of horror, suspense and the supernatural to create a story right out of the Stephen King playbook. She cleverly keeps certain “clues” at bay, so you are never quite sure who Amber killed until the very end, nor do you know whether Amber really believes in the Tall Man or whether she might just be using him as an excuse for her murderous behaviour. And while Amber and Sadie aren’t particularly likeable characters (making it difficult for the reader to empathise with either of them), the young filmmaker Greta and the unreasonable demands she experiences from her boss provides an additional element to the story, including the ethics of documentary making and the ways in which young people are taken advantage of in the workplace. Ultimately The Tall Man is an unsettling read rather than a thrilling one. There’s a few twists and turns along the way and the chopped up storylines provide an element of tension. The characterisation, particularly of Amber (elusive and narcissistic), Sadie (frightened, scatty and reliant on alcohol) and Greta (professional, ambitious but with a strong moral compass) gives weight to what might otherwise have been a fairly mediocre story. This is my 3rd book for #TBR40. I purchased it last year as a Kindle 99p special having wondered if it might be based on the “Beware the Slenderman” documentary that had so freaked me out when I watched it on TV a few years ago. I’ve been fascinated by this modern legend ever since.